This day started out with a lot of promise. And a good thing - it was to be our last scheduled chase day! 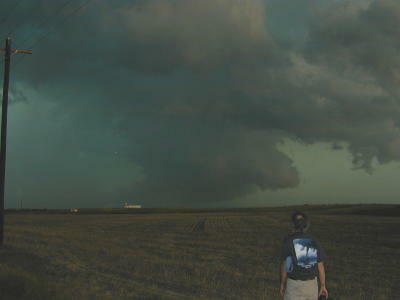 Chasing with us that day were the team in Graystorm (John Moore (Paradise Valley, AZ), Beth Moore(Paradise Valley, AZ), Jim Williams,Los Angeles), Matt Crowther and Betsy Abrams (Weather Channel - Atlanta), Patrick Kerrin (London, Ontario) and Greg Breneman (Chandler, AZ). The Storm Prediction Center had a moderate risk. 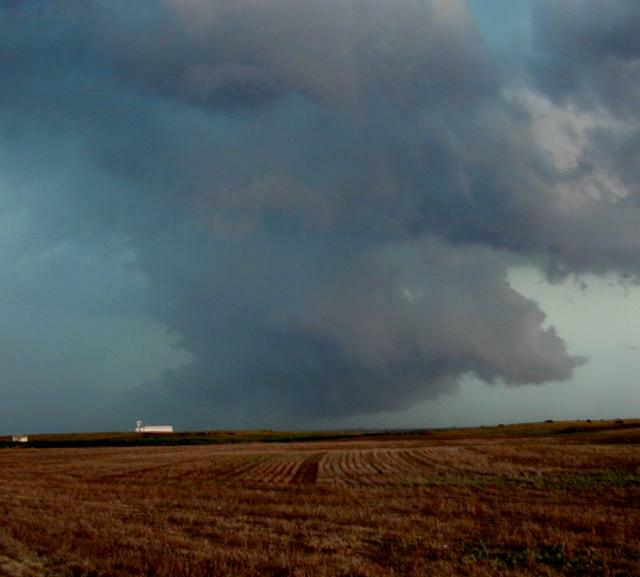 A front was draped across Kansas, and moisture was surging north. Enormous CAPE values were forecast. All looked good... except... once again the pesky moisture wasn't quite in the right place. Anyhoo... we sortied from Amarillo up through Liberal, KS towards Dodge. 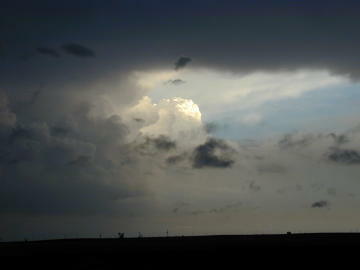 Radar was showing cells rapidly developing in extreme NW Kansas and rapidly developing towards the Southeast. Our target became Garden City, Kansas. As we approached, a severe thunderstorm warning was issued for Garden City and area, and radar and visual observation showed that the storms were already developing into a multicellular "blob." So we decided to try to get to where storms were still developing, to the SE. 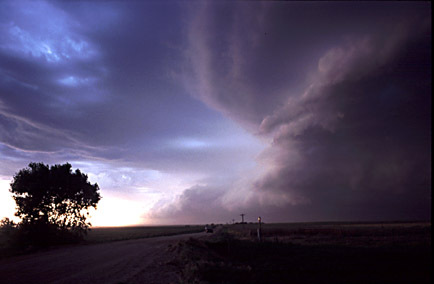 When we went through Dodge City, there was an intense storm to our immediate east. We ducked south out of Dodge, and stopped to look at a very impressive cloud formation. 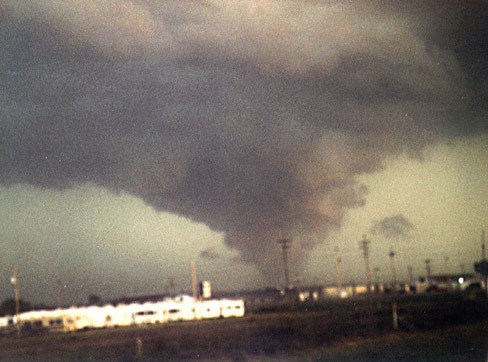 At first, it could easily be mistaken for a tornado (or certainly something ominous)... but it wasn't. 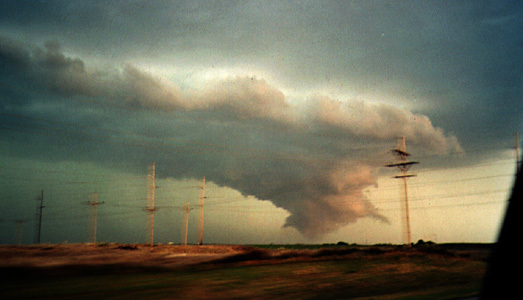 It was a large cloud hanging from the south side of the storm - almost to the ground. But... it wasn't rotating quickly and didn't show rapid upward movement. It did, however, have a lot of turbulence and movement throughout the cloud. We knew it would cause lots of calls to NWS, and sure enough, Dodge City got something like 150 calls. But they knew it wasn't a tornado, and did not issue a warning. However, the sirens were set off in town in spite of their advice. The first picture shows Matt Crowther watching the feature to his east. The next picture shows the feature close-up. Shortly after this, we observed outflow along a broad front. In fact, this outflow would become a remarkable feature, with winds clocked by doppler over 105mph, widespread damage, power outages over a third of Oklahoma, and winds all the way to Galveston. 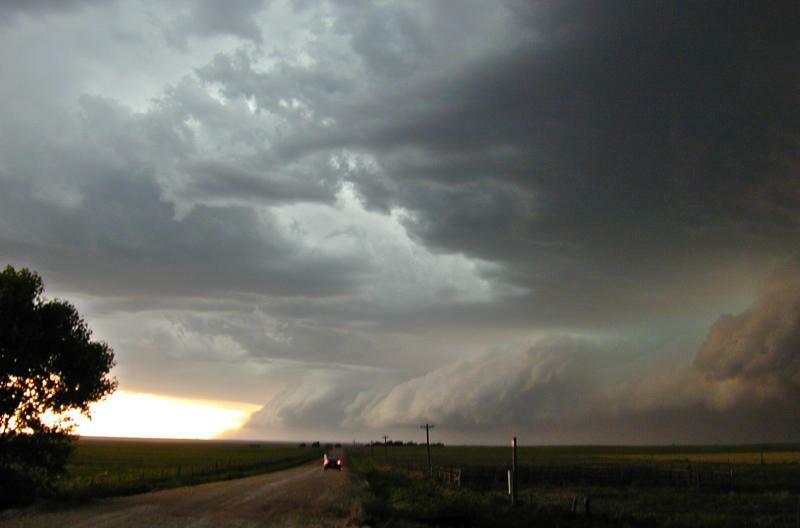 The following picture shows the spectacular shelf cloud and, underneath it, a haboob (large dust storm). It was a beautiful but threatening sight. We fled south to avoid the high winds, but eventually decided to head west towards new cells forming near Liberal. Shortly thereafter we entered the maelstrom. Winds were so high that grass and straw was sheeting across the road like water. As we entered Gate, OK, the power went off in the town. Shingles were flying off of one roof, and large tree limbs were breaking off and flying across the road. That was a bit much, so we decided to zoom south again and get ahead of the storm. Not a chance! As we reached 65mph, we noticed that the wind sounds in the car decreased. The southerly component of the winds were keeping up with us at 65! There was no way we could outrun it. So, we decided to head west at the next opportunity - it was on the way home anyway. We turned on E 210 Road to head west to US 270. According to our GPS and Delorme, we soon were driving in the middle of fields and hills - Delorme was a bit confused about road placement in this rural area. 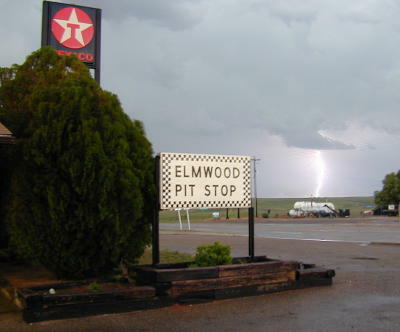 To our surprise, as we went west we came out of the storm! We stopped for a pit stop (and general calming down) in Elmwood. New cells were still firing to our SE, but we had to get back to Phoenix, so we bid the midwest goodbye, and began the long drive home.